It looks like Google’s convoluted messaging platform strategy could soon start to make a little more sense. Google has confirmed that Hangouts Classic will begin its slow death in October of 2019, but only for G Suite Customers. To be clear, most people out there aren’t G Suite users. That means that Google’s Hangouts Classic platform will still be around for the average Gmail user for at least the foreseeable future. G Suite Customers are anyone who pays to use Google’s suite of corporate services. If you have a custom, Google provided email that doesn’t end in ‘@gmail.com,’ you aren’t a G Suite customer. Google has still yet to reveal a death date for the standard version of Hangouts. The company says it plans to share the platform’s inevitable end date at some point in the future. 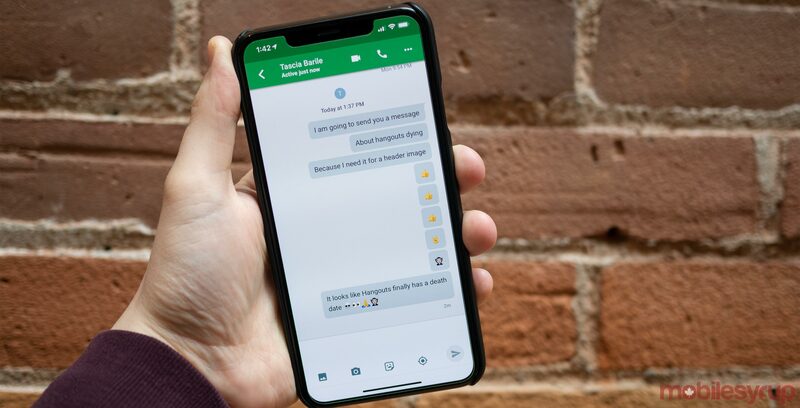 G Suite users will also be pleased to learn that Google has plans to improve its regular Hangouts Chat app with features borrowed from Hangouts Classic, including integration with Gmail, improved video calling, calls via video Google Voice and chatting with external users. At this point in Hangouts lifecycle and after so many announcements regarding the platform’s fate, it’s nice to have at least a little bit of closure. That said, it also sounds like if you use Hangouts primarily through Gmail as I do, your experience with the chat platform will likely remain the same regardless of if you’re a regular or corporate user.